10 minutes from Cardiff City Centre with its medieval castle, shopping centres, science museum, parks and Cardiff Bay waterfront restaurants . 15 minutes drive to a beautiful 2 mile long sandy beach and 5 minutes from Penarth marina with water sports available. Our family have lived at the property since 1986 and the main farmhouse was built in 1826. There is a coach house built in 1840 and the cabin was added in 2010 for family accommodation. We have rented the cabin since June 2017 with family having moved further afield. In a beautiful location in the country yet really close to beaches and City Centre shopping. Set in 3.5 acres of land laid mainly to gardens and orchard with views over surrounding countryside and further out over the Bristol Channel. This area gives you everything a city, beautiful coastline and beaches, marinas and waterside dining and the Welsh countryside. The views from the deck are breath taking, bringing the country indoors. Sheets, duvet and pillows for all 6 beds, changed after 3 days or upon request. Beautiful modern electric fireplace with crystals and real flame effect. Give out little heat, more of a feature as there is full central heating. Towels provided for up to 6 people, changed after 3 days or upon request. Coffee maker for expresso, cappacino or latte with Starbucks, Costa and Lor pods included. Enough for 6 people - dinner plates, side plates, bowls, cups, egg cups, cutlery, and a range of glassware. Open plan kitchen with all modern conveniences and lots of cupboard space. Open plan dining, living, kitchen with dining table views over the countryside and patio doors leading to balcony. Deck has patio set for al fresco dining. Large balcony with country views with double patio doors one from dining area and double patio doors from living area. Access from the balcony onto the 1 acre field, plenty of room to play. Whilst the cabin is on one level there are 6 wide steps to gain access from the car parking area to the cabin entrance so not suitable for wheelchairs. Tickets for rugby and events at Principality Stadium can be sourced on request at additional charge. Please note that due to the rural location of the property it MUST be kept locked when not at home and all gates MUST remain closed at all times. Ours was just a very quick 2 night stopover but enough for us to appreciate the degree of effort gone into making this lodge warm, comfortable, homely and welcoming. I wish we had had longer to enjoy the beautiful setting, the large spacious decking and the very well equipped kitchen. As it was the lodge had great extras, like sky cinema, and nice toiletries, fragrance diffusers, copious towels, a full cupboard of cleanjng products, Tassimo machine and other quality extras. Linda and Nigel are a delightful couple who kept us informed throughout the booking. Thoroughly recommended - but try and stay for a while to really enjoy it! Great cabin in a beautiful location with lovely owners. 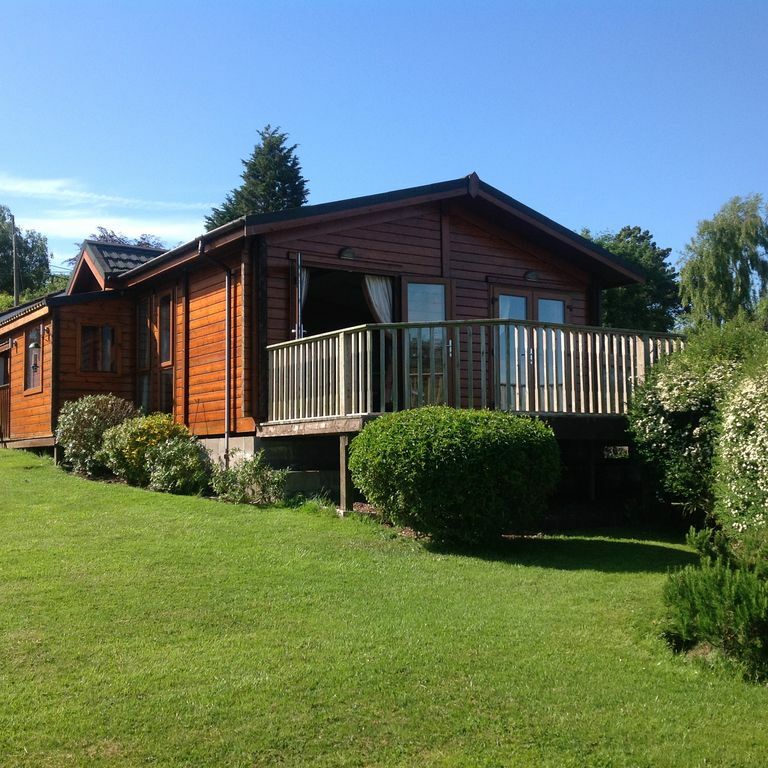 Excellent weekend break, cabin very clean, comfortable and well equipped. Easy access to Cardiff whilst enjoying peace of surrounding countryside. Welcoming friendly owners, would definitely return.Many Thanks. We had a lovely stay over Christmas at the cabin. Nigel and Linda were very welcoming and available to answer questions as they arose. The house is very well equipped and the kitchen had everything we needed to cook a Christmas meal for 5. The view from the house is beautiful and the location is perfect for Cardiff and the Vale. Thank you for your review Sandra and so glad your enjoyed Christmas at our cabin. Hope you had a good flight home and hope to see you again. Lovely cabin. It had everything we needed. The views off the balcony we're lovely, very peaceful. I would definitely recommend and stay again. The Woodland Retreat was perfect for our visit to Cardiff being beautifully quiet and relaxing whilst close to the city. The cabin was comfortable and Linda and Nigel welcomed us and looked after us very well.Their two pet/guard dogs were quite noisy at times but that didn't really bother us as we are all dog lovers. Some more local information in the cabin would have been useful, e.g.bus and train timetable, park and ride info., local takeaway menus. We would definetely recommend the property to anyone else. Great location, excellent property with great facilities. Very clean. Linda and Nigel were both extremely helpful, welcoming and pleasant.